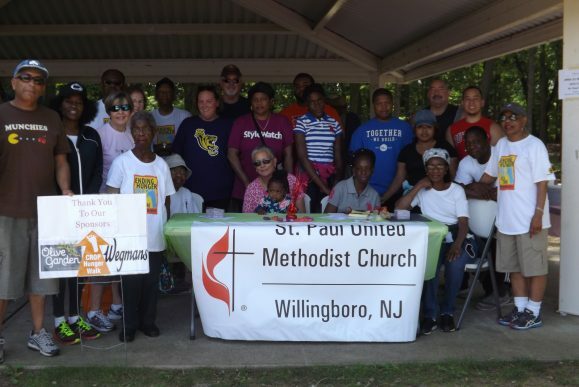 Members of St. Paul’s UMC in Willingboro stand together at the annual Hunger Walk. Photo provided. Thelma Burnett of Burlington celebrated her 100th birthday at the annual Hunger Walk. Photo provided. Hunger has a unique way of bringing people together. Sometimes the people that come together are from very different walks of life. On Saturday, June 4, the annual CROP (Communities Responding to Overcome Poverty) Hunger Walk was held at Mill Creek Park, Willingboro, where 125 faith and community leaders walked together to raise funds to help end hunger. “These volunteers are people who are positive, upbeat and who share in the dedication and commitment to change the world one step at a time,” said Linda Dippold, a CROP Walk Team member from St. Paul UMC in Willingboro. Volunteers at the event learned about global suffering due to lack of basic food and drinking water, connecting with those who walk globally to survive harsh conditions outside the comforts of western civilization. Together, with different ages, faiths, and backgrounds, volunteers raised money and awareness to help end hunger through the power of inclusion. 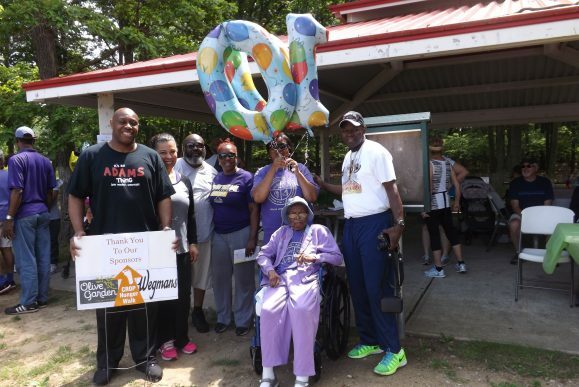 A variety of ages took part in the walk, from a three-month-old infant supported in his mother’s arms, to a 100-year-old woman, Mrs. Thelma Burnett of Burlington, who chose to celebrate her birthday by participating. St. Paul’s UMC in Willingboro facilitated the event along with the support of generous sponsors such as Wegmans, Mt. Laurel, and Olive Garden, Cherry Hill. The interdenominational event included faith and community leaders from throughout Burlington County. Among them were churches in Beverly, Willingboro, Burlington, Pemberton and Edgewater Park including the Beverly UMC and St. Paul UMC, Willingboro. Representatives from the Woman’s Club of Edgewater Park and other concerned individuals also participated in the Hunger Walk. Twenty five percent of the funds raised stayed in the local communities to support food pantries and meal sites. With families counting on local food pantries and meal sites during what becomes the hungriest time of the year, the challenge intensifies in the summer months as working parents face the added burden of paying for daycare and filling the gap in regular nutritious meals. The walk took place on a hot summer day with a hope to experience the change that Jesus brought forth as He walked from Galilee to Jerusalem transforming the lives of those He encountered. “We walked knowing we did not walk alone,” said Dippold. “For just as Jesus walked with the poor, the lonely, the sinful and the hurting, Jesus walked with us, and we walked to make a difference in the lives of others who are connected to us by our common heritage as children of God.” For more detailed information on how you can contribute to help end world hunger and support the annual Hunger Walk, contact St. Paul UMC at 609-877-7034.